When your personal injury lawyer files a lawsuit on your behalf, it’s quite likely that it will be resolved with a settlement. Many plaintiffs never see the inside of a courtroom because they decide to accept a sum of money in exchange for dropping the lawsuit. However, you do have the right to decline a settlement offer and take the defendant to court. A personal injury lawyer serving Riverside will ensure you are fully prepared for your day in court. Do plan to arrive early. It isn’t acceptable to arrive late to a court appearance or even to arrive on time. Instead, plan to arrive at least half an hour before you are scheduled to appear in court . Leaving your home with plenty of time to spare gives you some leeway in case you have car problems or encounter traffic delays on your route. When you arrive early, your personal injury lawyer will have time to give you some last-minute advice. Do dress appropriately for court. As a general rule of thumb, dress for court in the same way you would dress for a funeral. Men should wear a suit and dress shoes, and ladies should wear a pantsuit, skirt suit, or other conservative outfit that doesn’t reveal much skin and doesn’t draw unnecessary attention. If you have tattoos, make sure your clothing covers them up. Don’t leave your cellphone on. Leaving your cellphone on vibrate mode isn’t enough to prevent embarrassing disruptions in the courtroom. Turn it off instead or leave it in your car. You shouldn’t have any other electronic devices on, either. Your personal injury lawyer has probably instructed you not to speak in court unless you are directly questioned. 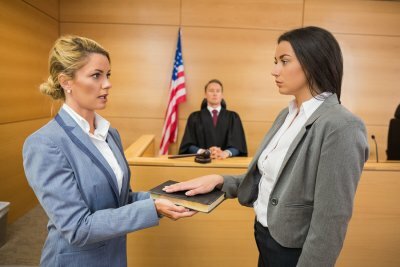 You may respond to the judge, whom you should address as “Your Honor.” If you’re on the witness stand, you’ll respond to the questions. But otherwise, it’s best to stay silent—and never try to talk to a member of the jury. Hearings and trials can be incredibly stressful, even if you’ve been in court before. But it’s important not to let your temper get the best of you. Even if the opposing counsel asks you questions that seem insulting, you’ll need to take the high road and maintain a calm demeanor.